I grew up in Massachusetts and never really understood people's fascination with the Civil War. In Massachusetts, the most famous war is the Revolutionary War. The Civil War is more like a footnote - at least, that's how it seemed to me when I was growing up. I guess it makes sense since the Civil War was largely fought in the South and the "shot heard round the world" happened right in Massachusetts. I suppose people tend to place more importance on events that happen in their own backyard. About fifteen years ago I moved to the South. It was definitely a culture-shock! In Kentucky, I was introduced to things like grits, biscuits and gravy, and sweet tea. People said things like, "fixin' to," "ink pen," "y'all," and my personal favorite, "all y'all." Many things seemed strange to me especially a palpable racism that I had never encountered in the North. I remember seeing confederate flags on some people's shirts, trucks, and maybe even flown outside their double-wide. 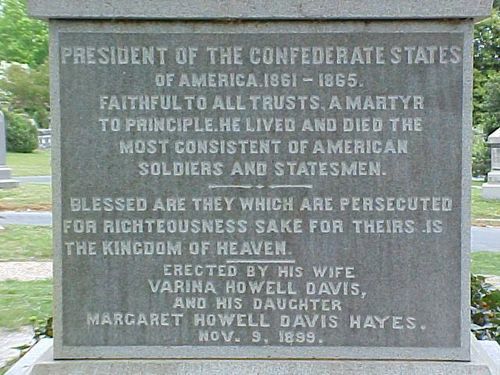 I remember feeling distinctly uneasy when someone at church informed me that the Civil War was really about state's rights. What about slavery? Wasn't it about that? I suppose the reasons for the Civil War are more complex than the single issue of slavery, but it doesn't feel right to attribute the war to "state's rights" while simultaneously leaving slavery out of the equation. I remember thinking that Civil War re-enactments struck me as a particularly comical thing to do. I used to like to make the joke that no matter how many times you re-enact the Civil War the North still wins. I don't think I'll make that joke again. Twelve years ago I married a southern belle. A year or so prior, I met my wife-to-be at Western Kentucky University. We were engaged fairly quickly. I didn't anticipate my northern upbringing being a liability, but then I met her extended family. The first time I met her grandmother was also the first time I heard the word "Yankee" used as a derogatory term. It was also when I learned that "Northerners don't hug." I remember being completely dumbfounded when her grandmother informed me of this particular truism. I mean, what do you say to that? "Yes, we do?" I just gave her a hug instead. Last year, I transferred with my company to our headquarters here in Richmond, VA. Richmond, of course, was the capital of the confederacy and, as such, saw it's fair share of civil war action. Given my blasé attitude toward the Civil War I have basically ignored all historical landmarks, museums, battlefields, and whatever other assorted Civil War attractions exist in the year since I arrived here...until today. Today, my in-laws came to visit. My sweet-tea drinking, "y'all" saying, state's rights advocating, southern hospitality hugging in-laws. And they wanted to see a little slice of history. The first stop today was a walking tour of Hollywood Cemetery. My son was interested in going to Hollywood until he found out this Hollywood had nothing to do with movie stars. Hollywood Cemetery was, in fact, originally named Holly Wood Cemetery, so named for the holly trees dotting the landscape. It is a beautiful, sprawling, hilly cemetery laden not only with holly trees but also with history. Monument to the 18,000 Confederate soldiers buried in the cemetery. 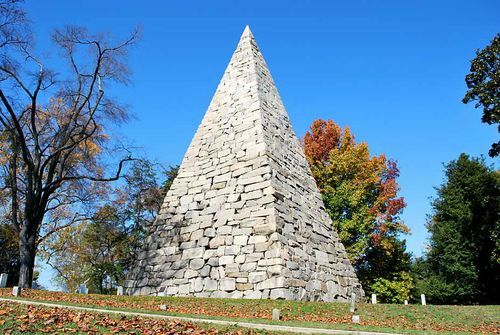 This monument is built without any mortar - the stones are freestanding. The tour was an hour and a half long and was pretty interesting as far as touring cemeteries goes, I guess. We saw everything except Jefferson Davis' grave which was further back in the cemetery than the tour went. So after the tour I offered to drive us out to see the grave, knowing my in-laws would want to go. So we have part of the Beatitudes on one side and now Proverbs 31 on the next side? 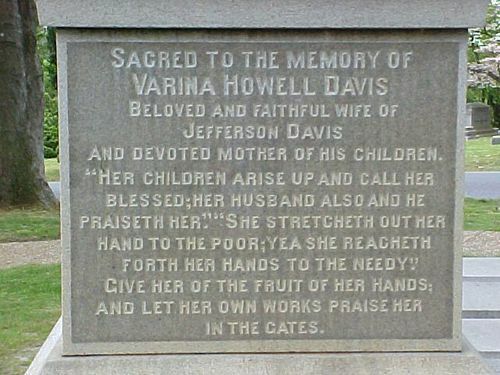 Now, I don't know anything about Varina Davis at this point in the day, for all I know her children did rise up and call her blessed, but all these verses on Jefferson Davis' tomb are really bothering me for some reason. And then my wife wanted to take pictures. You see, she wanted something to post on facebook - a sort of "this is what we did today" picture. At first she was going to take a picture of her parents next to Davis' tomb, but then my children ran over to be with their grandparents. Then she asked me to go be in the picture. I had an instantaneous negative reaction to this idea. 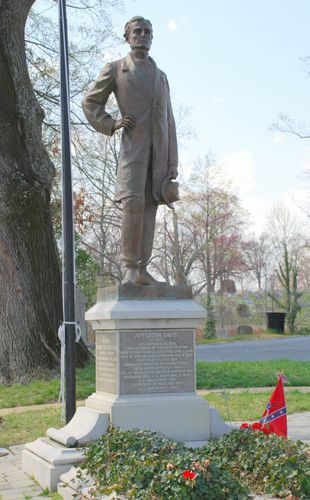 To have my picture taken next to this statue felt like affirming Davis, the Confederacy, and slavery itself somehow. So I said, "No, I'll take the picture." I didn't want to answer in front of my in-laws because I didn't want to offend them, so I just said, "I don't want to be in the picture." It probably came off a little more abruptly than I meant it and I'm not sure if my in-laws picked up on it or not, but, at any rate, I took the picture and I'm not in any pictures. 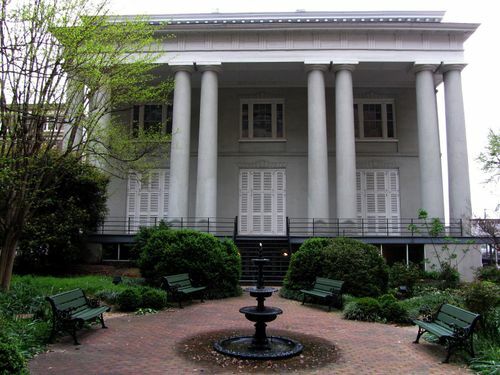 Next up was the Confederate museum and the Confederate White House. The museum and the white house are basically surrounded by VCU medical buildings. We parked in the garage and had to use the hospital elevator to get to the level where the museum was. My wife was trying to make sure we remembered where we parked and as we exited the elevator a black man who had been in the elevator with us said, "P-5, don't forget!" We thanked him and went on toward the museum. 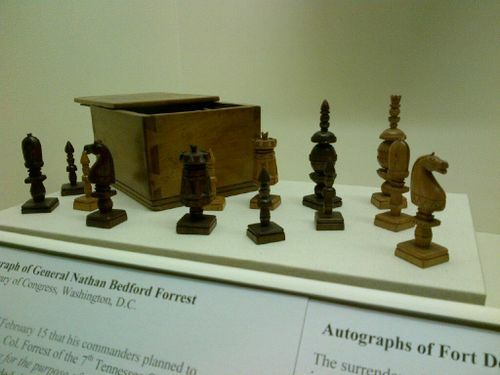 I mention this because in the museum and in the confederate white house I didn't see a single black person. No black visitors, no black employees, no black volunteers waving confederate flags in front of the museum and handing out flyers trying to stop the committee that is working to sell the museum to VCU. Yet when we walked through the hospital we encountered black people both ways. This is more of an observation than anything else, but it definitely made me wonder if blacks would want to visit this place. I suspect the answer is no. If I were black, why would I want to visit a place commemorating and honoring the confederacy? More than anything else, this makes me feel like the idea that the Civil War was about state's rights and not about slavery is simply so much hogwash. We went inside and purchased our tickets for the white house tour from a white cashier. Then we stood in a group of white tourists and met our white tour guide. We walked over to the white house together, walked in the white door, and handed over our tickets. Even the tickets were white. Formal garden and rear of the Confederate White House. In the Confederate White house we saw the entry-way and the faux-finishes on walls, fireplaces, and floors that was the style of the day. We walked up the spiral staircases. We saw the parlor, formal dining room, and the small room that Abraham Lincoln supposedly sat in after the war was won and just ten days before he was assassinated. We saw Davis' office from which he ran the confederacy and his bedroom next door. We saw Varina's dressing room and the childrens' nursery. Of particular interest to me were the two parlor rooms. One had a gaming table! It was built for two people and had a chess board as a top along with multiple drawers on the sides. 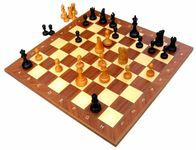 There was a hand-carved wooden chess set on the table. 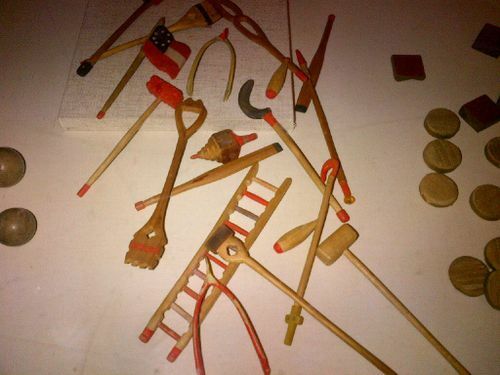 On another table was a deck of playing cards and, in the next room, an antique cribbage board. Unfortunately, photography was not allowed. 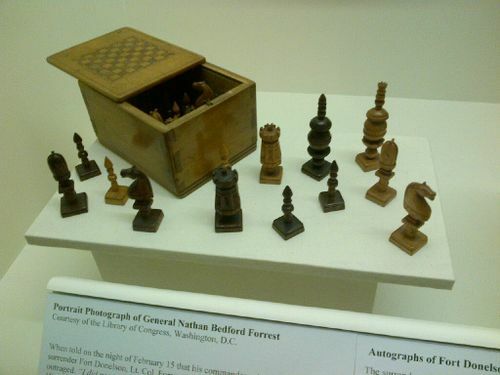 While the board games were not original to the house, the guide explained that every effort had been made to furnish the home with authentic civil war era pieces where originals had been lost. He told us that it was a common practice for music and games to be played in the parlor room as entertainment for guests. We learned that Jefferson Davis was a workaholic by today's standards, getting up early and working far into the night. Varina often stayed up transcribing missives for him as he dictated. We learned that his four children were known for their unruly behavior due primarily to Jefferson's indulgent parenting. Varina lived a stressful, anxious existence and had a coarse tongue. It's difficult to be in a man's home, see how he lived, hear stories about his family, know he was a fellow gamer (maybe a bit of a leap, I suppose), and learn that most of his children died young and not feel at least some level of sympathy for him. We exited by descending the narrow, straight, "servant's" staircase and out onto the side porch shown below from which Davis' son Joe fell, landed on his head, and died. I came away from the confederate white house feeling sad more than anything else. 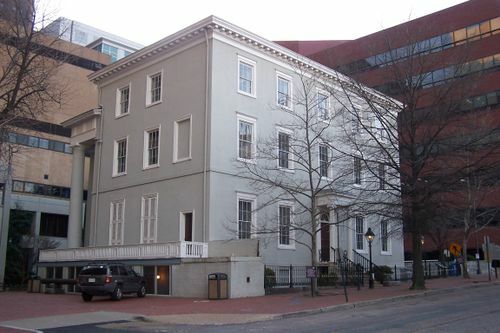 View of the Confederate White House from Clay Street. You can see the surrounding medical buildings and the porch where Joe Davis fell to his death. An officer in the 14th Mississippi Infantry, Lawrence was captured at Fort Donelson and imprisoned at Camp Douglas, then at Johnson's Island, Ohio. These pictures really don't do justice to the woodworking that went into making the pieces. Considering he apparently made it while imprisoned I'm amazed at the detail and quality of the set. We continued through the museum seeing tattered flags, bullet-hole ridden uniforms, and an ornamental sword with a corn-cob shaped ivory hilt. We saw J.E.B Stuart's ostrich-plume hat, Pickett's personal effects, and Robert E. Lee's tent. We read accounts of the battles and saw ledgers detailing the thousands and tens-of-thousands lost in combat. 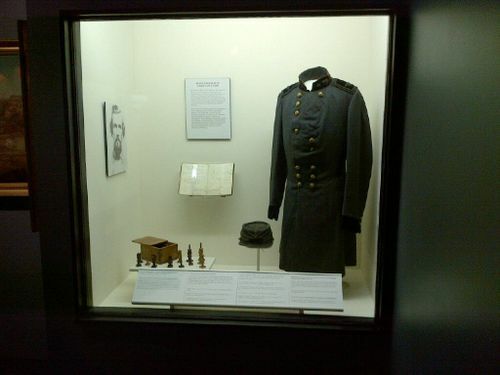 And then we walked into a room that endeavored to show the every-day life of the regular, enlisted, Confederate soldier. As it turns out, only about one out of every three Confederate soldiers owned slaves. Most of the men who fought did so because they were loyal to their state or because their homes and land were threatened by hostile, northern armies. 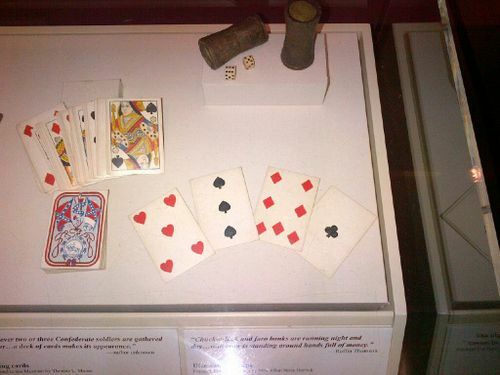 These cards were made in England and imported into the Confederacy. John C. Warden made these marbles while a P.O.W. at Alton Prison. 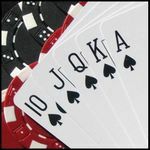 I was fascinated by the cards with Confederate flags on the backs and by the handmade jackstraws that also included a miniature Confederate flag. As I walked around the room I discovered that in addition to sharing my pastimes, many Confederate soldiers shared my fears, my faith, and my distaste for war. I also began to realize that while for me the Confederate flag and the Civil War may be synonymous with slavery, for the average Confederate soldier, it probably wasn't. This is my last letter to you. I went into battle this evening as courier for Gen. Heth. I have been struck by a piece of shell and my right shoulder is horribly mangled, and I know death is inevitable. I am very weak, but I write to you because I know you will be delighted to read a word from your dying son. I know death is near, that I will die far from home and friends of my early youth, but I have friends here too that are kind to me. My friend Fairfax will write you at my request and give you the particulars of my death. My grave will be marked so you may visit it if you desire to do so, but is optional with you whether you let my remains rest here or in Mississippi. I would like to rest in the graveyard with my dear mother and brothers, but it is a matter of minor importance. Let us all try to reunite in heaven. I pray my God to forgive my sins, and I feel that His promises are true and that He will forgive me and save me. Give my love to all my friends. My strength fails me. My horse and my equipments will be left for you. Again a long farewell to you. May we meet in heaven. As we were leaving I was speaking to my mother-in-law about the tragedy of the Civil War. I told her it was difficult for me to understand how people that shared the same faith could find themselves on opposite sides of a bloody war. She said she found comfort, knowing they prayed to the same God. Personally, I find that disturbing rather than comforting. 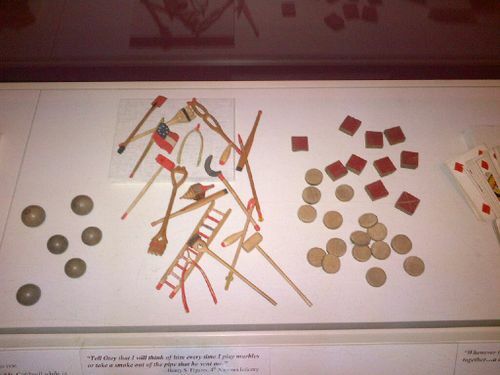 Regardless, I left the museum with a sense of kinship with the South I had never felt before, forged in part by simple games.